These enchanting holiday ecards for business highlight a vintage style lantern with snowflake covered glass and a candle burning brightly. The lantern is very pretty and delicate and you can see there is an old style handle for you to hold. White fluffy snow covers the top of the lantern gloriously and you get a lovely warm feeling of Christmas time in the air watching this cosy candle burn. 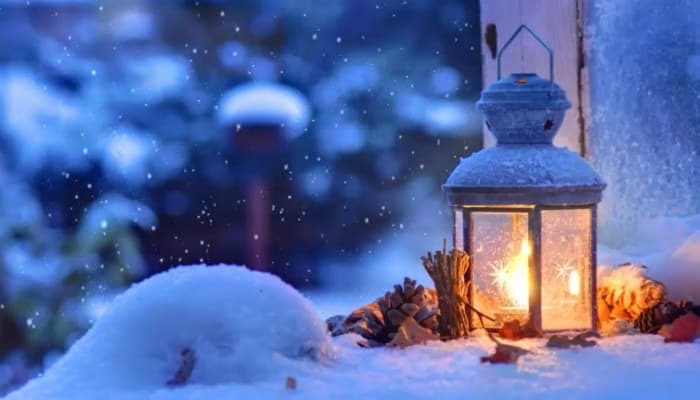 Pinecones surround this beautiful lantern and it is placed on a blanket of snow. The background is slightly out of focus so that the lantern showcases the image. By adding a few personal touches to the ecards you could really make this design your own. We always find adding a company logo and uploading staff signatures to the ecards really give it that all around personal touch to your customers. At Ecard Shack, we pride ourselves on stunning corporate designs for you to choose from. Our range is very extensive and we have something for everybody. Why not send a electronic Christmas cards for business this year and see how exceptional the benefits are. Our cards are so easy to design, by simply following a 4 step process. Please visit our website and see for yourself how straight forward this is.